There is no history without story. The blue aircraft hanging in the top right is the Truculent Turtle. 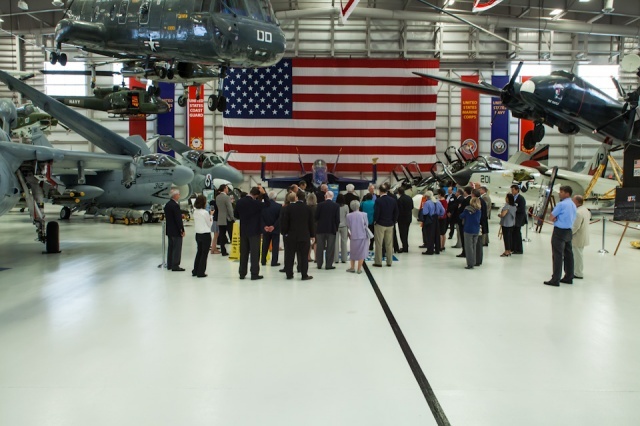 Recently I got commissioned to photograph an event for the Florida Banker’s Association at the Pensacola Naval Museum. I always love going to the Naval Museum so this was a treat to combine it with getting paid. But going in, I had no idea what a treat it would be! 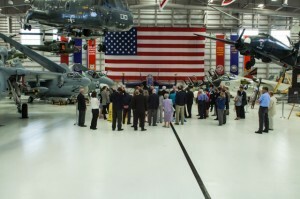 The event started at the National Flight Academy building, built to resemble an aircraft carrier, with cocktails and mingling with about 50 bankers from all around Florida. Here is a brief rundown from the NFA website about what it is about. This building is really something to check out for all ages. Captain Charles E. Ellis is a native of Texas. After receiving a draft notice, he enlisted in the Navy in November 1961, and later attended the University of Texas at Austin under the Naval Enlisted Scientific Education Program, graduating in 1968 with a Bachelor of Science Degree in Mechanical Engineering. He was commissioned after completing Officer Candidate School. Capt. Ellis served in a variety of submarine billets, including command of USS Skipjack (SSN585), USS Louisville (SSN724) and USS L.Y. Spear (AS36). His duty ashore included a tour on the staff of Submarine Group FIVE, during which he earned a Master of Science Degree from Chapman University, and a tour as Commanding Officer of Naval Submarine Base, Kings Bay, GA, from which he retired in December 1992. Capt. Ellis was employed as Provost of a Distant Learning Center of Georgia Military College until October 1997. His decoration and awards include: Legion of Merit with 2 Stars, Meritorious Service Medal with 2 Stars, Navy Commendation Medal with 2 Stars, Navy Achievement Medal, Meritorious Unit Commendation with 2 Stars, Navy Expeditionary Medal, Sea Service Deployment Ribbon with 3 Bronze Stars, National Defense Service Medal with 1 Star, Good Conduct Medal and Navy “E” Ribbon. Capt. Ellis is married to the former Judy Stevens of Crowley, Texas. Everyone then gathered for a personal tour by the Naval Aviation Museum Foundation’s Vice President of Development, ex-deputy CEO, and a member of the Naval Museum Board of Trustees, Retired Captain Charles E. Ellis Jr. 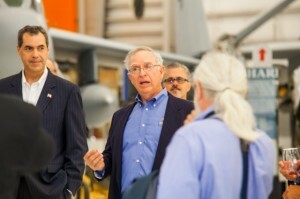 He provided some incredible stories surrounding many of the aircraft displayed throughout the museum. And since I like to take friends and family to the museum and act as their tour guides, these new stories will enhance my “tour” many times over. One of my favorites was the story of the baby kangaroo, a.k.a. One Long Hop, that traveled on one of the aircraft named the “Truculent Turtle” for 55 hours without refueling It flew from Perth, Australia to Columbus, Ohio setting a world record at the time. For the first day during the flight One Long Hop would not eat or drink because of being scared. It was right about the 24 hour mark that he started to drink water, eventually eating shortly after. The crew was relieved as they were not sure he was going to make it. Now why there was a kangaroo on board? I am not sure as Capt. Ellis never said, and I cannot find anything online other than he was donated to the Washington Zoo. I can tell you this, seeing how small that cockpit area is, I cannot imagine being trapped in there for 55 hours, especially with 3 other people and a kangaroo! Another story that will always stick in my head was about a tiny Cessna Bird Dog that was built by the United States Military and later in its life assigned to the South Vietnamese Air Force during the Vietnam War. This story takes place on board the Aircraft Carrier Midway during the evacuation of all U.S. military forces from Saigon, Vietnam. The carrier was headed back to the U.S. when a tiny plane, the Cessna, came into view. At the controls was a South Vietnamese Air Force pilot. And he made several passes over the carrier dropping pieces of paper. Eventually one landed on the ship. It was a note requesting permission to land. The carrier found someone aboard to interpret for the pilot so they could communicate. He said he wanted to come aboard and did not have enough fuel to make it back to land. Well he had never seen a carrier before, let alone landed on one so the captain of the ship told him they would make a hard right turn which would flatten the sea out so he could land on the water and skip across to a stop. That the plane would probably lose its wings and tail section but he would have a good chance to survive the crash. But he told them that would not be good as he had his wife in the plane as well as his 5 children stuffed into the cabin and tail section! The captain then made the decision to clear the deck and allow him to try and land. They stuck 50 men on the deck to help aid in grabbing the plane in case it started to go over the edge. They were not needed. The little plane landed without trouble and stopped within 200 feet. Many of the men on board chipped in money to the tune of $5000 to give the family to help them get started with their new life in America. The family took up residence in Miami, Florida. The children all went on to be successful and start families of their own. What was so great about this story was that I was getting a first-hand account, as Captain Ellis was aboard the Midway that day. And stays in contact with the family still. There are several more good stories saved up in my memory, such as the Swaztika, the sawed off propellers, battle results painter, side to side landing and more. If you want to hear them you will have to visit the Museum with me or go on a tour with Capt. Ellis himself. The evening ended with a filet mignon dinner (which I did get to eat) and a moving tribute to the President of the Florida Banker’s Association. FBA President, Alex Sanchez being showered with gifts from fellow bankers to acknowledge his great service with the FBA and his life achievements. As a surprise, many of the FBA got together and got a few gifts to give the FBA President, Alex Sanchez. He had no idea it was coming. Alex was 18 and came to the U.S. from Cuba on a boat with his parents during the height of the Cuban Missle Crisis, and the U.S. Air Force. Several spoke about his great patriotism, “Alex likes to greet soldiers coming back from war zones right when the get off the planes” one speaker told us. We learned of his love for Reagan and Bush. 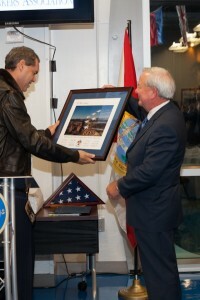 He was honored with autographed framed photos of the Blue Angels and the Thunderbirds. He even got a per-recorder video message from congressman Jeff Miller. When Alex was at the podium he had to choke through the tears as he thanked everyone. Like I said, it was quite moving and something I felt honored to be a part of. The night was not always a bed of roses though. In fact it almost did not happen for me. Days earlier I had lost my wallet. So when I went to drive onto the base I was asked by the guard to show my driver’s license. I could not therefore I could not get on base. I drove straight home and had to get Sharon to drive me on base to the event. Not knowing how I would get back home from there other than having Sharon come back and get me, hoping Nora had not gone to sleep yet. I planned on asking someone at the FBA for a ride home, perhaps someone was going by my house as it is on the way back to I-10 and could help me out. Luck was on my side. All of the bankers were staying at a hotel just a few blocks from home, and a trolley was coming to take them all back. I was able to hitch a ride on the trolley and all worked out.